Welcome to South River Ice Hockey! Registration is open for the 2018 Alumni game. We plan to have two teams of Alumni facing off against each other. We will celebrate afterwards with dinner upstairs until 8pm. Please register at the link on the right. The SRIHC, a non-profit organization, is a youth sports organization that represents the residents of the South River High School feeder system in the Maryland Student Hockey League (MSHL, www.mshl.org). The South River Ice Hockey Club was founded in 2003 as part of the Maryland Scholastic Hockey League. During the 2006 – 2007 season, South River defeated Linganore High School in Howard county to become the Maryland Class 2A champions. For the Maryland Student Hockey League, SRIHC fields teams at the Varsity (9-12th grade) and a Junior Varsity (9-11 grade) team. We are governed by an elected Board of Directors, comprised of a president, vice presidents, a secretary, treasurer, and team managers/representatives. To ensure an avoidance of conflicts of interest, no head coach is allowed to serve on the Board of Directors. These hard-working parent volunteers meet frequently to ensure the club runs smoothly. The entire club membership meets several times a season for a business meeting and to elect new board members. Representing and playing for their hometown high school with the friends they go to school with is an important part of all high school athletes’ experiences. Since hockey is not a sanctioned school sport, SRIHC makes it possible for our young men and women to “play for South River” and feel as though they are true student athletes. SRIHC is a community-based organization. The friendships and relationships that we build go much further than the hockey team; the bonds that we parents, players, and siblings share will last a lifetime. We forge these bonds during our frequent practices and games. Then we wind up the season with our Annual Banquet, which all players and their families attend to honor players’ achievements and re-live the season with the entire club. Our funding comes mostly from parents, although the club is sponsored by various businesses in the community and holds several fundraising events, to help offset the high cost of ice time for each player. Under the leadership of last year's officers, most of whom are returning for the upcoming season, SRIHC was able to provide more to its players and their parents than it originally promised. 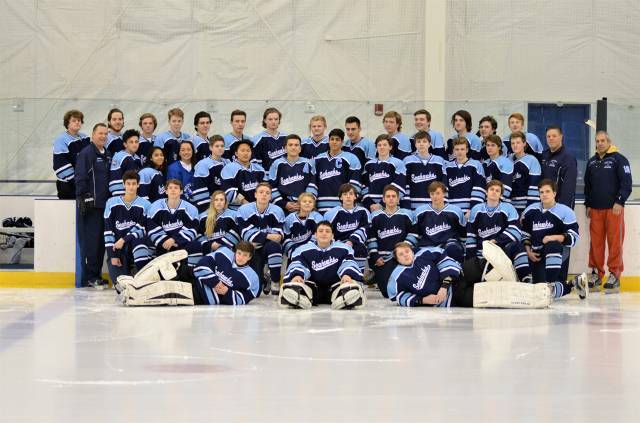 We a true Junior Varsity team and this year plan to have the JV team compete in the MSHL JV league. The officers and members of SRIHC believe SRIHC is one of the premiere hockey clubs in the MSHL. We don't judge that status based on the number of championships we have won. Instead, our goal is to continue the growth of both the team and the player. Tryouts for the South River Ice Hockey Team will be at Navy Arena on Wednesday Oct 3 and Oct 10 at 3pm. Any player, regardless of playing ability is welcome to attend tryouts. No experience is necessary. South River will have a JV and a Varsity team this year and will try to roster every player who attends tryouts. If you cannot attend tryouts, please contact Coach Fohs. Prior to tryouts, all players need to register at the link on the right. Players also need to bring a check for the tryout fee and proof of their USA hockey registration to the first tryout. Senior goaltender Joseph McElhenny stopped 23 shots that he faced on route to a 2-0 win over Broadneck to help the team advance to the Maryland State Quarter Finals. All the scoring that South River needed came from Vincent Venuti in the second period. Vincent first goal came at 13:04 in the period, assisted by Ethan Frantz and Bailey Riddle. Vincent’s second goal came at 4:43 and was assisted by George Roberts. South River played a smothering defense and was led by George Roberts, Ty Kaplow, Sean Gavin, Britt Cave-Hawkins and Thomas Pedersen. South River dominated the third period keeping most of the action in the Broadneck end of the ice. The aggressive forchecking was a key to the victory, led by Michael Fohs, Mike McElhenny, Nick Kandra, Cian Foran, Chris Mohler and Sean O’Hara.